Tailings dams are challenging to monitor due to their size and inaccessibility. Satellite InSAR offers a robust and effective monitoring solution to support local geotechnical engineers in risk evaluation for reasons of safety and operational continuity. The case. 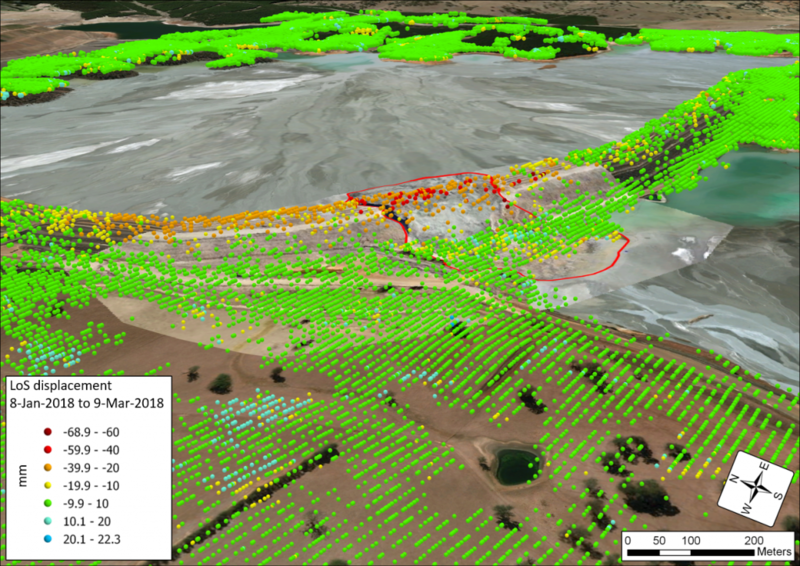 In early 2018, a mine in Australia experienced a large tailings dam collapse at one of its storage facilities. Immediately after the event, comprehensive geotechnical monitoring was installed, to ensure safe remediation works. Satellite radar images acquired over the area since January 2017 have been processed to show the capability of InSAR to support local geotechnical engineers in understanding the spatial and temporal evolution of the displacement before the collapse. A further analysis of the time series of deformation shows a clear pattern of acceleration, beginning almost one-and-a-half months before the incident. The inverse of velocity method implemented by using the InSAR time series makes it possible to predict the timing of the failure almost one month before the failure occurred. The map shows the cumulated displacement field measured before the event and superimposed on the aerial image of the aftermath. You can visit our mining market page here.